This is my keeper boy for 2016. He has a muscular body and neck, his pelt is so tight, you cant pinch an inch on him! His contrast and coat clarity is simply breathtaking. Ink black expression on a white background, sparkling with glitter. He has wild expression and small rounded ears, and a low slung walk with a thick tail. Silver Lining comes to us from my good friend Gaynor at Queenanne cats. His pedigree includes Awagati lines. with their wild look on his mothers side, and Calcatta on his father side. His wild look and huge outlined rosettes, reminiscent of a clouded leopard, caught my eye. He has a straight to slightly convex profile, which flows over the top of his rounded head and back-scull. His ears are set to the side of his had and are nicely rounded. We are hoping he will pass on his wonderful qualities when bred to carefully chosen girls in 2017. 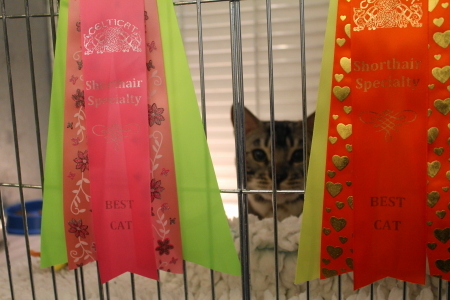 Otto is an outstanding boy sired by my very own Regional win Supreme Grand Champion Silverstorm The Maharajahs Cat. His mother is an extremely pretty clear coated and contrasted silver seal-lynx owned by Dinah Ashley-Cooper. Otto has luxurious silky, glass like pelt, with ink black to the skin rosettes, beautifully contrasted on a pale silver clear background. He has a low slung leopard walk with a thick tail, a wild head and expression, with small ears and large nocturnal eyes.